The Spanish company (stand in Hall 15 / H14) was the only company at the Wire Fair that was presenting a comprehensive family of machines for fastener control, in addition to a wide range of forging tools. Although these are two separate product lines they both share constant innovation and the application of the latest technologies in product development. In Düsseldorf, Lazpiur (Hall 15 / H14) was presented a new ‘on the fly’ component inspection machine. In terms of tooling, the company provides both standard and wear tools. Out of more than one thousand exhibitor companies at the Wire fair this year, there was but one that offered two lines of very different products (tools and inspection machines) which nonetheless share common factors: innovation, precision and quality. In Dusseldorf, Lazpiur was showcasing a comprehensive range of fastener inspection machines and, as a test, has included their latest development at the fair: the BEGItech CLT machine, boasting an inspection system that detects parts while they are in the air, with the capacity to inspect up to 800 parts per minute. Lazpiur exhibited in Hall 15 / H14, in a 63 square metre stand. 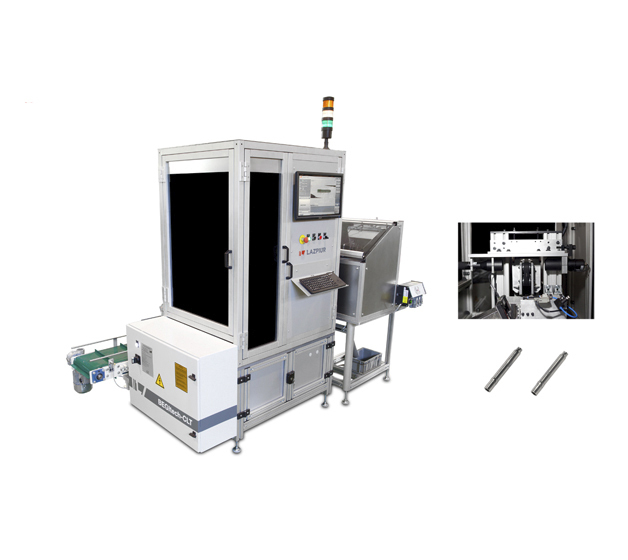 The company demonstrated a leading position in the production of fastener inspection machines, with cutting edge technology in the company's part inspection/verification machines: dimensional vision inspection, surface defect analysis with photometry, mechanical checks of mountabilty / go - no go, eddy current to check for cracks and/or verification of heat treatments... all of which is managed by one single software system which is applicable to the various types of machines. Lazpiur is in fact the only player in the market offering a comprehensive range of this type of machines, to cover the varying typology of parts with different inspection requirements. The latest technology developed by Lazpiur is called "on the fly", whereby inspection is performed while the part travels in the air. This BEGItech CLT machine stands out for extremely high accuracy, and is perfect for parts such as shafts, pins, .... The machine meets a market demand in sectors like screw making and bar turning. Lazpiur is also a leading player in the forging tools sector. The century-old company presented its latest innovations in this field where it has to become an international benchmark. It was the only company at the fair with such a wide range of products, as Lazpiur specialises in manufacturing both wear and standard tools. The company, with headquarters in Bergara (Spain), has also broadened its range of cold forging products in recent months with new types of dies based on new technological developments. The benefits of this new technology include manufacturing cost savings, which can be of special interest in the automotive sector. For this reason, the last two important European forging sector congresses (in Berlin and Glasgow) have invited Lazpiur to present the latest innovations in the sector. Lazpiur was able to take up the challenge of manufacturing this type of technically highly complex tooling by building upon the experience gained over many years in the manufacture of extremely hard high-speed steel tooling (67 HrC) under high accuracy standards. These parts, in addition to accuracy, require a highly polished finish and a strict control of geometry. Wire was the bench mark industrial exhibition for the wire, piping sectors held from 4 to 8 April in Dusseldorf. This year marks the biennial event's 15th edition with a venue of circa 60,000 m2, specifically focussed on companies operating in the wire sector which welcomed 1,280 exhibitors from 51 countries. It played host to machinery and tool manufacturers as well auxiliary component manufacturers in the various engineering sectors.